I cannot stress to you the importance of reading books to children. Not only does it encourage speech, it also helps them to learn sentence structure, phonics, their alphabet and colors, as well as emotions! Hannah is a reader. The highlight of her week is when her grandma brings her books from the library. I do go to the library, but sometimes it is difficult to get out the door with two little ones. So, mom does me a favor and helps me out. :) Some of Hannah's favorite books are the ones with real photos in them...she seems to connect really well to those types of books. She also LOVES any kind of book that has an animal in it. Recently, I contacted a company that I found and was very interested in their products. I was very excited to share this company with my readers as I KNOW most of you have children and I know the importance of books in a child's life. I named my business after my daughter, Isabelle. When she was around 4, she made the connection that Disney's princess Belle loves books and loves to read and I thought it confirmed that Belle's Books was the perfect name for my business. Not to mention that Belle happens to be my favorite Disney princess! Selling these books has become a personal joy for me! I know you and your child will enjoy these books as well! I have waited a long time to get this business going and have held on to this verse: "Take delight in the Lord, and He will give you the desires of your heart." Psalm 37:4. Thank You, Lord, for giving me the desires of my heart and allowing me to start up this business! I have several titles to choose from, all of which are designed for babies and toddlers on up to ten year olds. Yes, even ten year olds like them! What I find really great about this company is the Bible verse that is used...I am a Christian and LOVE to see businesses that are not ashamed to give credit to God. That means so much to me and would definitely make me want to promote the company more! "God Loves Me" is a hard cover book that puts 'Hannah' into different scenarios in which she gets to talk to God. Playing at the park, going to school, trips to the zoo and visits to the doctor. It teaches her to be thankful and to be kind...both of which are good things for her to learn! I firmly believe in prayer and this book shows how easy it is to pray and how wonderful it can be to love God. When it came time for Hannah to sit down and enjoy her book she was enthralled! It was such a special treat for her to be able to hear her name read throughout the book. She definitely loved it! The colorful pictures and artwork were very eye-catching as well...that helps! There were many more, but this is just a taste of some of the amazing books from which you can choose! So, in my opinion...Belle's Books is a super cute company. I love the book I received for this review and was very satisfied with the quality. The way my child's name was intertwined within the book was wonderful. I would definitely recommend this company to any parent, grand parent, aunt, uncle, brother or sister who is looking for the perfect gift for a special child in their life. Karrie, the owner of Belle's Books has offered to give away a free book (valued at $12.95 and under) to one of you! I am SO excited about this giveaway!!! Visit Belle's Books and tell me which book you would choose should you win this giveaway! You do not have to be a blogger to enter, but you must have a valid email where you can be reached should you win. If you do not leave an email address, it must be where I can easily find it. This giveaway is open to US residents (one entrant per household) and will end 5/11 at 11:59 pm EST. The winner will be chosen using random.org and will be notified by email. The winner will have 48 hours to respond, or another winner will be selected. 1. Follow me on GFC. 2 entries, so 2 comments. 5. Follow Belle's Books on Twitter. 1 entry. 6. "Like" Belle's Books on Facebook. (If you are able, leave a comment letting them know I sent you!) 1 entry. 7. Subscribe & confirm your subscription to my blog via email. 2 entries, so 2 comments. Disclaimer: I received no monetary compensation for this post. I received a free book from Belle's Books for review purposes. All quotes are from the Belle's Books Website or Email. All thought and opinions are 100% mine. I would choose Little Mermaid. I'd get the Three Little Pigs book. I would get any of her Sesame Street books that feature Elmo! I would like God Loves Me. I liked Belles Books on Facebook. for my three year old since she is still in pull-ups and taking a long time to be potty trained. 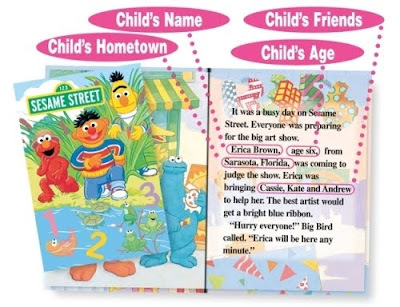 I'd choose the My Day on Sesame Street Personalized Childrens Book. My little girl would love it! Since we are trying to teach our daughter about God, I would pick the God Loves Me book. I know my daughter would really love the Ballerina Princess book! I would choose the My Baby Book. 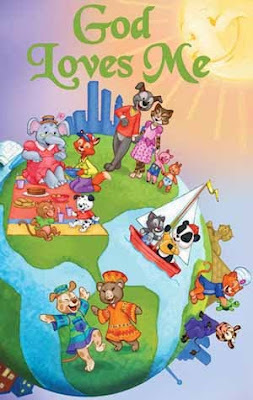 Noah's Ark Personalized Childrens Book.